Cannabis Clearinghouse Coalition for Model Industry Standards is the first clearinghouse for the Cannabis industry standards, best practices, safe harbors, and solutions. There are numerous conflicting federal and state issues to reconcile including real estate, banking, investing and lending. The Coalition seeks to convert all related industry and consumer diverse and conflicting self-interests into comprehensive workable solutions, standards, and safe harbors. eJoin Confidential List! | eMail Us! From HAMP to HEMP! CCCMIS Chairman Rydstrom is calling on Congress to hold cannabis deconfliction hearings to enhance economic and public policy uniformity. On January 16, 2019, California three state cannabis licensing authorities announced that the Office of Administrative Law (OAL) officially approved state regulations for cannabis businesses across the supply chain. Please note,these new cannabis regulations listed below take effect immediately, meaning the previous emergency regulations are no longer in effect. Presentation Seminar by Rich Rydstrom, Esq. 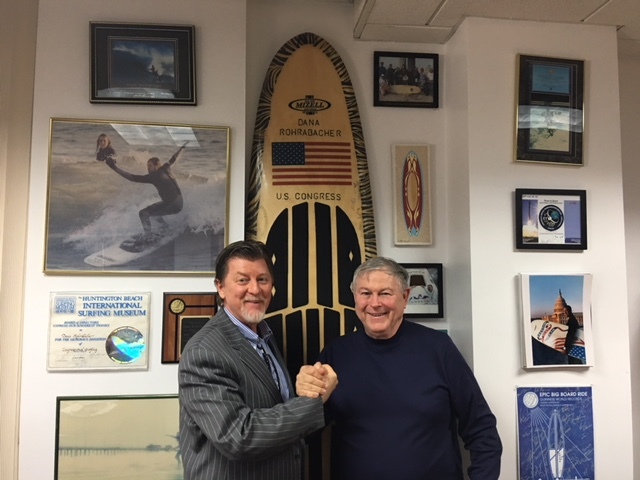 Congressman Dana Rohrabacher’s Cannabis Memo Shows Great Leadership. Cannabis Clearinghouse Coalition for Model Industry Standards is the first clearinghouse for California Cannabis industry standards, best practices, safe harbors, and solutions. There are numerous conflicting federal and state issues to reconcile including real estate, banking, investing and lending. The Coalition seeks to convert all related industry and consumer diverse and conflicting self-interests into comprehensive workable solutions, standards, and safe harbors. New industries require new laws and new relationships which often conflict. When the Federal government and the state governments (“California”) are in a state of confliction, and during the years to follow, the industry and consumer require reconciliation of diverse conflicting interests. CMIS has served that role successfully during the Great Recession, and now CCCMIS is now available as a clearinghouse for new standards, best practices, safe harbors and solutions. All related interests and associations should participate to achieve success for the industry and its consumers. strengthened the weak and strengthened the strong at the same time?” No this is not Mr. Rydstrom speaking to the Cannabis industry, this is Mr. Rydstrom speaking to the new mortgage modification industry while in a state of crisis back in 2006, 2009. The same is here for the Cannabis industry. Reconciliation is a mandate to succeed. CCCMIS will step up and fulfill that function. All Cannabis associations and networks and their lobbyists are called to cooperate and join in our efforts to jointly reconcile diverse self-conflicting interests. CLICK HERE TO eJOIN US! SmartCannabisLease ( http://smartcannabislease.com ) which deconflicts federal and state law presumptive facts. Another is the TaxSmartBuildout (http://smartbuildout.com ) which integrates lines of business with IRC 1245/1250 tax smart construction property flowing into beneficial entity structures. Rydstrom says, after 28 years of litigation, tax, FASB and business experience, safe and lawful best practices and safe harbors are available to the multidisplinarian mindset, to the limit of law. Smart Cannabis Addendum But what can an attorney do to protect interests which conflict with the federal government? An attorney along with the help of a commercial real estate broker can fashion an Addendum which establishes the lawful and factual foundation upon which a client may legally enter the lease safely, and in cases of the tenant who is a prospective Cannabis licensee, ensure that the terms and conditions do not violate the vast new Cannabis licensing regulations proposed November 17, 2017 and Cannabis tax regulations proposed November 19, 2017. RydstromLaw - Smart Cannabis Addendum! Terms & Use Conditions: This site features legal articles by Attorney Richard Rydstrom and prior CMIS articles. CMIS was in force to reconcile diverse interests during the Great Recession, and its mission ended with the expiration of HAMP. CCCMIS is an information site. CCCMIS is a private association think tank. We are not lobbyists and not acting as attorneys. Nothing from this site should be considered advice or info on how to avoid federal jurisdiction, or how to hide from or hinder any federal law inquiry or action, or engage in any activity considered unlawful or illegal; all topics are strictly concerned with California Law only and its lawful activities All Rights Reserved 2000-2017 Terms & Use Conditions: CONFIDENTIALITY NOTICE UNAUTHORIZED INTERCEPTION IS PROHIBITED BY FEDERAL LAW [Electronic Communications Privacy Act of 1986, 18 U.S.C. 2701(a) and 270(a)] Articles sent are not legal, tax, financial or business advice; may be deemed an advertisement from the State Bar. IRS CIRCULAR 230 DISCLOSURE NOTICE: To ensure compliance with IRS requirements, we inform you that any U.S. federal tax advice contained in this communication is not intended or written to be used, and cannot be used by any taxpayer, for the purposes of (i) avoiding penalties under the Internal Revenue Code or (ii) promoting, marketing or recommending to another party any transaction or matter addressed herein.